You can listen to the podcast or read it below… yer choice. Yes, it’s yer old independent philosopher, jim cranford. Welcome to the show.. so glad you could make it. In episode one we finished up talking about communication and how it is fundamental to living things on all levels. That exposes another circle jerk mainstream science runs on us. Humans are the only creatures that are intelligent, they say. We got that from tool use and such, which gave us bigger brains etc. We used our big brains to learn to language and all that. It takes intelligence to communicate, and since only humans have it, the exchange of information between single cells, microorganisms, plants and other animals must be instinct or some kind of automatic response not requiring a big brain. However, when the information thus exchanged is used to make choices, intelligence is surely involved. We like to separate instinct and intelligence, but both are the result of learning. The choices we make are based on experience; ours in the current life cycle and others in the past. It’s all information that we use to make choices everyday. If you look at the display our nervous system provides us, it is nothing short of ingenious. It has taken a massive intelligence to engineer human consciousness. It was/is no accident. It took intelligence to get us here, so we can act act like we have no brains at all. What is a system? A system is any group of interrelated parts or components that cooperate and share processes. Like a common goal. Systems thinking is based on the belief that the component parts of a system can best be understood in the context of relationships with each other and with other systems, rather than in isolation. Systems thinking focuses on cyclical and holistic causes rather than linear cause and effect. In other words, what you do is follow the flow of energy, matter and information through the various components and parts and see how they’re related. One of the first rules of system science is that there is no such thing as a closed system, as they are all interconnected and share energy, material and information. So actually we don’t study systems at all, we can only study subsystems. Mainstream science hasn’t caught on to this yet, but continues to study subsystems in the laboratory, far removed from their Natural environment. Science has acted as if they could set up a closed system, unaffected by the outside world, and be confident in the reliability of their results. Sure enough, it has been discovered that not only do outside forces like celestial rhythms and cosmic rays affect all interactions, but those with that were left out because the subsystem was moved into the lab, were influencing their results as well. Besides that, it has lately been determined that the expectations of the researchers were also skewing the results. 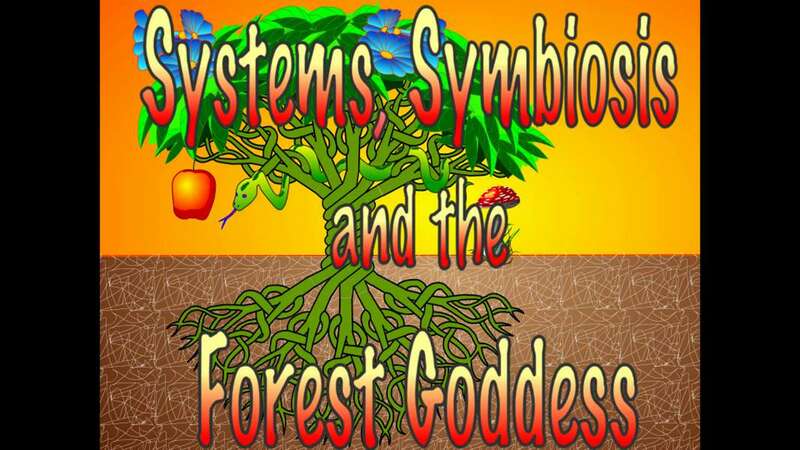 Another great thing about systems thinking is that it applies to all sorts of systems, biological, cosmic, educational, financial, social, bureaucratic, and since there are only subsystems, you can see how each of these seemingly separate areas is interconnected and interdependent. You know the classic example, a furnace and thermostat. The thermostat turns the furnace on and off to maintain a steady temperature. Natural systems are like that except every cell acts like a thermostat. Besides reporting it’s temperature, it also reports energy usage and other status information. The system uses that information to regulate all activity. For example, here’s what the basic forest loop looks like. It begins with water and nutrients being provided to the roots of a tree by the microbial mat. This mat is the combined growth of fungi and bacteria that services just about all plants with roots. Besides the nutrients the mat also supplies antibodies to the plants. It is this microbial mat that is the star of the show. Nothing grows without it. The tree pumps the solution up to the leaves where photosynthesis occurs. That’s the simple description, but this transport system is a phenomenal accomplishment in itself. Billions of tiny passageways route this life’s blood through a maze of branching tunnels which provide just the right amount of everything to every cell. The last cells in line use light energy to make sugars. Then these sugars are transported through this wondrous on-time supply system to building sites, some of them way back down in the tips of roots. Some of the sugars are used to entice and feed pollinators, while still more sugars are used to build fruit and seed. The seed is for reproduction, and the fruit entices and feeds the seed distributors. All of this activity produces a steady stream of leaves, flowers, bark, feces and dead bodies that fall to the forest floor. This litter is a constant flow of matter and energy as well as information about the state of the forest. This flow is disassembled and analyzed by the microbial mat. Each bit of litter carries the information of its path through the system, dropping off molecules here, picking some up there. The microbial mat furnishes the input, then analyzes the output of each loop and adjusts accordingly. Like i said, there just isn’t any way to achieve this level of efficiency without making intelligent choices. It takes constant monitoring, evaluation and planning to maintain this level of successful operation. The kind of logistical efficiency doesn’t just take communication, it takes superior communication. Ask UPS. Okay, what happens if the forest dries up and blows away? Apparently something like this is what our ancestors had to deal with. Whether the forest dries up or a new forest is beginning to form, the forest process is stripped down to the bare bones. We still have some basic plants, the real survivors, and our most basic microbes. The roots of each grass plant has a bit of the microbial mat attached. When researchers looked closely at root fungus interface, they found that there was no clear dividing line between them. The cells in between pure root and pure fungus were composites, containing elements of both root and fungus. Something to think about. At the very beginning of the forest progression we have the same fundamental process that takes place in a mature rainforest. Although the path is much shorter, moisture and energy follow the same feedback loops, from the microbial mat, through the plants and back to the mat. So, the essence of the forest is not the trees at all, but plants in general and the microbes that inhabit the soil. It is these microbes that benefit the most from the existence of the forest. It would appear that the microbes have built forests to protect and nourish their colonies. This is where science and religion agree… not about the microbes, they’ll never go for that, but they agree that our ancestors started out in a lush forest and migrated out onto the savannah. Here we find other creatures who moved out of the forest as well. One of the most interesting critters to make the move is the leaf cutter ant. I mentioned them in the first episode. These ants are important for a couple of reasons. First they show us a subsystem that is very similar in structure to an animal without the skin. Second they show us how species adapt to changing climate. There are three distinct species involved in these ant colonies. There are the ants, the fungus they cultivate for food and a bacterium that regulates growth of the fungus. As the ants are the only species visible to us, they seem to be number one. The second species in this three way symbiotic relationship is the fungus. Its exact species grows as a mushroom on the forest floor, but this strain has been propagated by simple cell division for millions of years. Each nest is a clone of the original mycelium, with no fruiting body or spores. The third partner is a bacterium that is common in the forest as well as in the guts of human beings. In the human body as well as in the ant nest, this bacterium regulates the growth of fungi. So we have a representative of each major microbial group and a very efficient mobile species teamed up in a very tight relationship. Within this three way symbiotic relationship, the ants are the only ones who have changed at all. The bacterium and the fungus are running the same DNA as their close relations, but the DNA of the ants is very different from any of their relatives. The fungus and bacterium are doing roughly the same job they perform in other symbiotic relationships. One change in the ant’s anatomy was a gland on their underside that secrets food for the bacterium. In the fungus farms, the ants are constantly crawling over the fungal mat, carrying leaves. Thus the bacterium is brushed onto the mat, keeping the fungi from overgrowing. Within the leaf cutter ant system the fungus provides nutrition for the ants and acts as an immune system for the colony. When the ants bring leaf parts into the colony they usually carry any number of foreign bacteria and fungi that should be able to set up shop in the cozy subterranean environment. However the resident fungus isolates the intruders and surrounds them with a fungal growth that keeps them from growing. The ants then move this chunk of immobilized intruder out of the digestion chamber. This symbiotic strategy has resulted in a pure strain of fungus that has lasted for millions of years. The colony also acts as sort of immune system for the whole forest. The reason leaf cutter ants have been studied at all is because they pose a real threat to agriculture in tropical forests. They can defoliate an orchard in a matter of hours. In normal activity the ants prune leaves off of a variety of established species, spreading out their needs with no detrimental effect on the forest, but if a new species attempts to get a foothold, like an orchard, the ants go to work and defoliate the intruders in no time. In the case of the fungus tended by the leaf cutters, they have shortened the normal feedback loop. Instead of having to wait for information to fall back down to the forest floor, to be digested by the microbial mat, the ants can be sent directly to a trouble spot, collect information on the threat and eliminate it, if necessary. The immune system is at the very core of a sense of self. The body/mind system identifies itself as a functional unit, both on our conscious and basic cellular levels. Within the colony the fungus understands the difference between that which is “colony” and that which is not. At the forest level, the colony understands the difference between forest and non-forest species. Making these kinds of choices demonstrates understanding, the very definition of intelligence. These ants have been able to adapt to the loss of forest cover by burrowing into the ground. The design of their nests manages to maintain optimum temperature, humidity and air quality for the growth of the fungus and friends, regardless of the above ground climate. You think the nearly brainless ants figured this out? Remember, if you or i were to learn how to build such a ventilation system we would have to go to school for years. It is much more likely that the fungus is the source of this wisdom. The fungus grows a mycelium that follows the same growth patterns as, looks like, and is proven to function like, a nervous system. Functionally the fungus performs the duties of an immune system, a digestive system and a brain for the colony, just as the microbial mat does for the forest.